Teach Literature Analysis the Fun & Easy Way! Check out my guest post today! 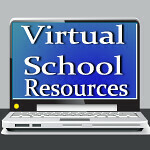 Why would I want my kids to learn virtually? Check out my article on Examiner.com today! More good news for those of us fortunate enough to live in Florida!